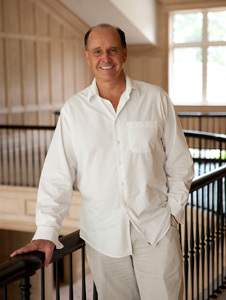 Jeffery Collé has long been heralded as the premiere design builder of the Hamptons, owing to his artistic, precise and environmentally protective approach – and creative legacy and love affair for the South Fork that spans over four decades and continues to shape the landscape in untold ways. Deftly fusing the old with the new, Collé’s projects have earned international acclaim for their detailed innovations and designs, frequently gracing the pages of publications such as Architectural Digest, The New York Times, Forbes, House Beautiful and New York magazine. Collé is distinguished by his uncanny eye, unwavering adherence to Old World craftsmanship, exacting standards of excellence, and use of superior, customized materials often painstakingly sourced from antique and contemporary findings around the globe. Quality is Collé’s unwavering mantra – while meticulously crafting magnificent East End homes to last for generations, he is well known to pioneer building innovations that foster his vision within the unique Hampton’s character and climate. With a degree of professional pride rarely seen today, he leads a crew of highly skilled master carpenters, millworkers and cabinetmakers who fabricate on-site to his precise specifications. Collé is well known to forge lifelong relationships with many of his delighted clients, who include local and international Wall Street moguls and luminaries such as Alec Baldwin, Donna Karan and Billy Joel. Among his most notable projects to date are his work on the renovation of a 12,000-square- foot triplex penthouse at The Pierre Hotel in New York; the total restoration of a 28-room, 16,000-square- foot historic mansion in East Hampton originally owned by the Gardner Family; the record-breaking moving and relocation of a 20,000-square- foot mansion in Water Mill; a recording studio for Billy Joel; and the renovation and enlargement of the Pond House, the turn-of- the-century Stanford White artist studio on Georgica Pond. Collé’s most current building project is a 24,000 square foot home on a 20- acre property, in collaboration with celebrity designer Stephen Gambrel and the internationally acclaimed architectural firm of Backen, Gillam & Kroeger. Collé is also passionately dedicated to safeguarding the Hamptons from overbuilding, opting for expansive lawns, gardens and orchards instead of crowding multiple houses on large parcels of land. Many of his homes feature generous reserves, protecting the beauty and agricultural origins of the Hamptons. On a 62-acre piece of ocean front property on Daniel's Lane in Sagaponack, Collé designed the subdivision to have just five houses and almost 45 acres of reserve. Thirty-four acres on Sagg Pond - purchased from the Lauder family - have only two lots and over 25 acres of reserve. And on a current project - a 40-acre parcel in Wainscott - the subdivision will have only seven homes, with plans for a 28-acre working organic farm shared by the residents. Collé’s love of building began early in childhood, as he worked alongside his father and grandfather in their Long Island construction business. He established his own company – JC Construction Management – in 1978, known today as Estates by Jeffrey Colle. Jeffrey Collé is happily married to Stacey Collé. They, and their children - Lily, India, and Falon - live in Wainscott, NY.